Don't miss one of Downtown Hartford's most fun events! 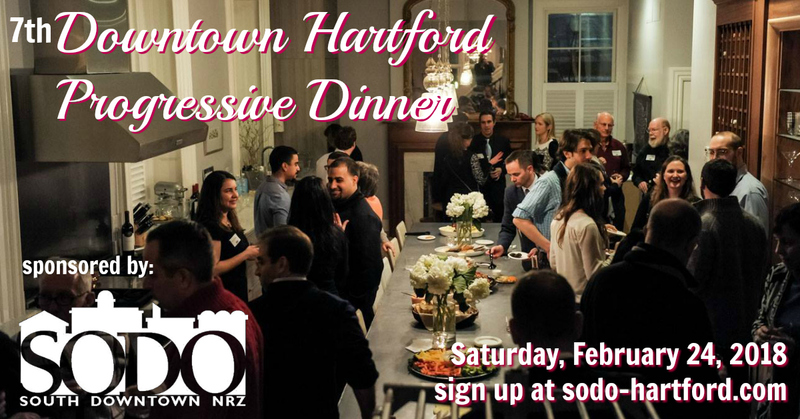 The Downtown Progressive Dinner, Sponsored by SoDo brings together a jovial group of Downtown Hartford neighbors for food and drink and to foster active community participation. Hosts and Attendees will meet at a beautiful, historic private home for mingling, wine, and appetizers and get their dinner location assignment. After dining at their hosts' neighborhood homes, everyone will regroup at another local spot for dessert and more catching up. At past events, many said they were reluctant to leave their respective dinner parties, as they were having such a good time. We hope you'll join us Saturday, February 24, 2018, for a wonderful, walkable evening of conversation, food, drink, and community with your fellow Downtown neighbors. Sign up in advance as a Host or Attendee (see links above, no tickets will be sold at the door) to attend, or if you have questions, send us an email at sodonrz@gmail.com. A portion of the proceeds from the 2018 Progressive Dinner will go towards programs and neighborhood enhancements supported throughout the year by the SoDo NRZ.